This post was contributed by Matthew Jayes, from the School of Business, Economics and Informatics. 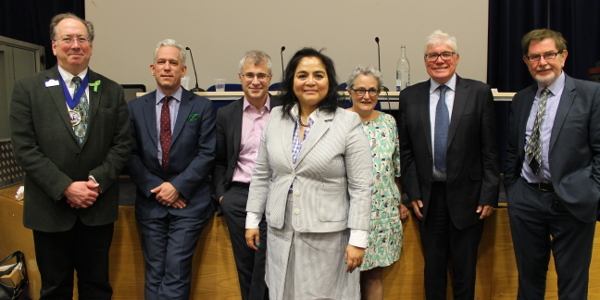 Birkbeck’s Department of Management hosted the second annual International Business Seminar in partnership with the Worshipful Company of World Traders on Wednesday 16 May 2018. The seminar featured speakers from academia and industry, including Chair of the event, Michael Mainelli, Executive Chairman of Z/Yen Group and Master of the Worshipful Company of World Traders. 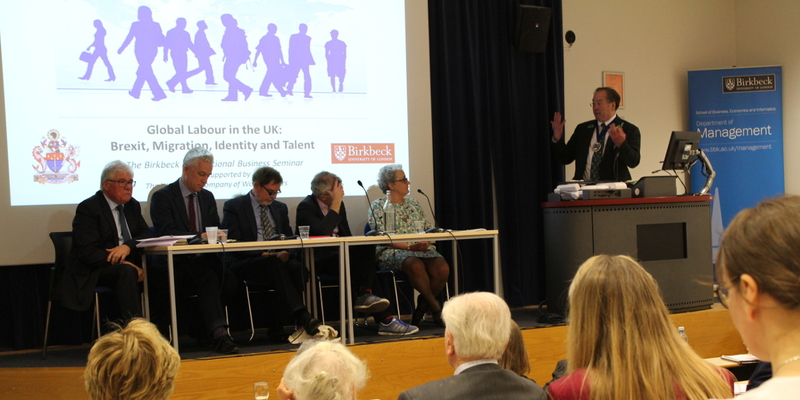 The audience ranged from Birkbeck staff, students and alumni, World Traders, policy-makers, and business representatives. The evening opened with presentations from two renowned academics who discussed their own research related to the themes of Brexit, migration, identity and talent. Jonathan Portes, Professor of Economics and Public Policy at King’s College, London, began by summarising the current policy context surrounding the UK’s imminent withdrawal from European Union (EU). Portes, whose father migrated to the UK from the United States to join Birkbeck’s then newly-established Economics department as joint-Chair, highlighted official statistics indicating the decline in numbers of EU citizens migrating to the UK since the referendum result. In advance of the latest quarterly official migration statistics, Portes suggested he did not expect to see a significant reversal of this trend. For those who might endorse the Conservative and Unionist Party manifesto pledge to reduce net migration to the “tens of thousands” and therefore see these statistics as ‘a move in the right direction’, Portes highlighted the concern amongst businesses of access to talent and skills. Indeed, reflecting on the Chair’s opening remarks about the number of non-British EU nationals currently employed in the UK working in the Financial Technology (FinTech) sector and drawing from examples of Higher Education and Healthcare, Portes suggested this trend should be a cause for concern. Dr Rebecca Gumbrell-McCormick, Senior Lecturer in Management at Birkbeck, responded by providing a robust summary of the Trade Union response to global migration. Drawing from a selection of Portes’ published articles, her own research, and other leading voices in this field, Gumbrell-McCormick looked at broader global migration patterns and associated causes of tension. Global labour migration reacts to push and pull factors, notably the continued divergence between wages and working conditions. Focusing on the difference between Northwestern Europe and Central Eastern Europe, Gumbrell-McCormick asserted that businesses have created a demand for low wage labour deliberately through their business models. Such demand is serviceable only when there are limited or no alternatives for workers in their locale. According to Gumbrell-McCormick, the UK trade union response has demonstrated solidarity with global workers, highlighting the need for fair movement from an early stage in the debate. However, there are still concerns remaining, for example trade unions are fighting the abuse of self-employment status by foreign workers – but also by British workers too. The European trade union response to global migration has been more varied, with Gumbrell-McCormick highlighting the differing response to free movement from German and Austrian trade unions. One area felt to be consistent across trade unions in the UK and European counterparts was the willingness to work together with foreign worker communities, providing information, support and solidarity on matters of rights being upheld. Gumbrell-McCormick suggested that the UK trade union position on migration and free movement is largely similar to the business position, highlighting the need for trade unions to play a role of critical friend to prevent any reduction in the quality of worker rights. First to respond to the presentations was Douglas McWilliams, Deputy Chairman, Centre for Economics and Business Research (CEBR), stating “migration is an amazingly creative but disruptive force.” For McWilliams, the UK needs the boost to creativity and dynamism afforded by those who choose to relocate for better opportunities. Indeed, for him, the UK cannot afford to reduce net migration to the tens of thousands through restricting inward movement. McWilliams challenged the audience to ponder how the impact of migration can be measured in relation to dynamism rather than net tax contributions, since he expects the former would prove much more valuable. This theme ran throughout the discussion in various forms; for example, the audience was asked by James Sproule, Member, European Advisory at L.E.K Consulting, to consider how a state might reliably measure creativity, grit, ambition, dynamism and entrepreneurialism in individuals accurately through a visa application process. The panel’s industry representatives were clear these types of attributes are those required for the future success of productivity and the UK economy. As an employee of Birkbeck’s School of Business, Economics and Informatics, as well as a 2016 alumnus of the MSc Creative Industries (Management), I could not help but reflect on my personal experiences. I am also a member of the Work and Employment Policy Advisory Committee at the London Chamber of Commerce and Industry (LCCI). The LCCI published a report in November 2016, ‘Permits, Points and Visas’, prepared by McWilliams’ CEBR, which outlined a number of recommendations from the London business community following the outcome of the referendum. The panellists suggested that the context has shifted and relaxed since the report; however, the needs of the capital should not be underestimated. Portes indicated that it is highly likely controls on migrant labour will be focused not at national borders but at the workplace, with landlords and public service providers. Whilst the concept of a distributed system could be argued as more democratic than a highly centralised system, certainly concerns of small businesses around resource capacity should be considered. Matthew Taylor, Chief Executive of the Royal Society for the Encouragement of Arts, Manufactures and Commerce (RSA), produced ‘Good Work’, an independent review of modern working practices. The relationship between good work, good living standards, and talent requires further research, especially when considering business competition for global talent. Whilst the current immigration policy context may be focused on restrictions, the speakers sounded a word of warning that the UK may not receive the desired quantity of visa applications from those it wishes to attract if there are too many restrictions in place. For me, this also raises questions around the nature of talent and skills development. Beyond the aforementioned concern of how an administrative process may accurately measure desirable individual qualities, there appears to be the issue of temporality and lived experiences. For example, how many successful businesses emerge from chance encounters or from identifying a niche in a market one has been working in for some time (perhaps in a low-skilled role)? My experience of working on the development of Enterprise Pathways at Birkbeck allowed me to interact with many wonderful, dynamic Birkbeck students, many of whom are aiming to change careers entirely. Thus, whilst government austerity was discussed on the evening, surely the current debate around talent and migration must focus on how the UK can better develop its capacity to support citizens and migrant communities, both of which are rich sources of innovation and creativity. Portes reinforced this belief, asserting that “diversity makes us collectively better.” Certainly this is a belief strongly held at Birkbeck and is manifest in our widening access and outreach activities, and demonstrated by our pioneering Compass Project which enables asylum seekers to have access to higher education, recognised with a major prize at the Guardian University Awards 2018. This International Business seminar series is an important addition to the ever-present polite public debate at Birkbeck, and on behalf of staff, students and alumni, I would like to extend my gratitude to the Worshipful Company of World Traders for their ongoing support. If you are interested in attending future events at Birkbeck, please visit the events calendar. Douglas McWilliams, Deputy Chairman, Centre for Economics and Business Research. Richard Portes was hired alongside A.G. (Bertie) Hines (1935-2018) in 1971 by the Master of Birkbeck, Ronald Tress, to establish the Department of Economics. Hines was one of the few black professors of economics at the time, a Jamaican migrant to the United Kingdom. “The economic impact of Brexit – induced reductions in migration”, Oxford Review of Economic Policy, vol. 33, issue supplement 1, 2017. With Giuseppe Forte. “Immigration and the UK-EU relationship” in The Economics of the UK-EU Relationship: From the Treaty of Rome to the Vote for Brexit (edited by Nauro Campos and Fabrizio Coricelli), Palgrave, 2017. “Immigration after Brexit”, National Institute Economic Review, vol. 238, no. 1, 2016. “What about the workers? The implications of Brexit for British and European labour”, Competition and Change, vol. 21, no. 3, 2017. With Richard Hyman. “Resisting labour market insecurity: Old and new actors, rivals or allies?”, Journal of Industrial Relations, vol. 59, no. 4, 2017. With Richard Hyman. There was a rather wonderful moment during the evening where one of the panellists, a self-proclaimed ‘Brexiteer’, was rewarded with a round of applause from the audience for comments made about seeing a common humanity rather than labels such as ‘migrant’ or ‘immigrant’. According to the speaker, it was the first round of applause they had ever received. Sadly, it is unlikely to make newspaper headlines during a time of great concern from certain politicians and commentators over free speech in universities.